Beer ratings can be problematic. On the one hand, they can be a great way to get a general feel for a beer before you shell out cold, hard cash to purchase it. On the other hand, when it comes to beer, everyone has their own tastes and preferences. The Doc is partial to Double IPAs, Slouch loves his dark lagers…I’m a sucker for Belgian-style ales. That’s not to say Aleheads don’t appreciate good beer in all their forms. It’s just that…well…sometimes our personal preferences outweigh the overall collective wisdom of the masses. There’s nothing wrong with that, of course. If we all agreed about every beer on the market, sites like this wouldn’t have much reason for existing (other than to serve as distractions from our real jobs). We’d all just hop on BeerAdvocate.com, see which beers got an A+, and drink those. *Although, even compared to other terrible action movies, it’s still an absolute shitfest. *That didn’t come out the way I wanted it to. The Brother pours a deep, attractive burgundy with a dense, tan head that dissolves properly for a high-ABV beer (9%). Lacing is present, but not pervasive. The nose is perfect for a Dubbel. No hops to speak of, but a robust, sweet-caramel malt profile is met in force with aromas of rich, dark fruit (the Wife detected plums, raisins, and ripe cherries). A strong, peppery spice cuts through the sweetness and a mild, biscuity yeast note lingers in the background. The taste is as well-balanced as the nose. The tartness of the fruit esters hits your tongue first followed by the sweet, robust flavors of caramel malts and Belgian candi sugar.. The aftertaste is a warming, delicate mix of spice and alcohol burn. *That didn’t come out the way I wanted it to either. 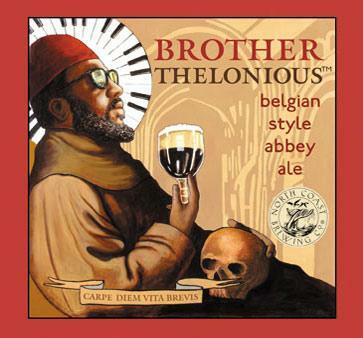 Posted in Tasting Notes.Tagged Belgian Style, Brother Thelonius, Dubbel, North Coast, Strong Ale. Well I’m glad I found this site. I’ve had a bottle waiting for New Year’s Eve for about a month. I just looked up this beer on Beer Advocate and was a little disappointed in the the review. Of course I’ll judge the beer myself. Thanks for pointing out that Beer Advocate reviews shouldn’t keep people from trying a potentially really good beer. Previous Post WHITHER TEN FIDY?